Once again I was walking the aisles at Sam’s Club looking for a wine I hadn’t tried, as I didn’t plan on buying wine during this visit. I saw this wine (Fidelity) and decided to read the label, which was informative enough to tell me that it was a red blend. If you’ve followed some of my other postings you’d know these are some of my favorite types of wines mostly because the blending a wine maker does is very intriguing to me. Anyway, for $9 I’d give it a try and now I should get back there to pick up more bottles. The first aromas reminded me of a dusty, woody cellar (somewhere all of us wish we had to store our wines). Another smell and ripe blackberries were predominant. After a few tastes, a fruit forward dominance from the Merlot along with soft tannins balanced everything out from the other 2 varietals in this blend. With 83% Merlot, 16% Cabernet Sauvignon and 1% Cabernet Franc, it classifies itself as a Bordeaux blend. Medium body with a slight oaky feel on the palate gave this a great mouth feel along with a smooth finish hinting of cocoa. This is a great bargain wine from a relatively unknown wine maker, Nick Goldschmidt. I’ll be on the hunt for some of his other wines now. 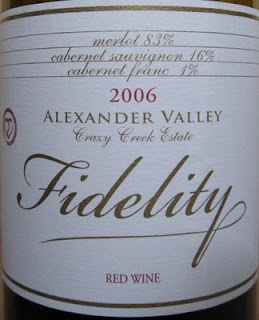 I picked up a bottle of Fidelity @ Sam's this past weekend; I couldn't resist the $2.91 price tag. It was quite pleasant...esp. for the price. I had the same experience this weekend. This wine is awesome!!! Does any one know which Sam's (city,state)still has this wine? I have been drinking this wine for over 2 years and would always buy it at my local Sam's Club, but in the past 2 months I have found they are not selling it anymore. Anyone know how I can get my hands on this wine again??? Enjoying a glass as I read this. Worth the trip to Sam's Club at twice the price.